If you’re interested in reloading your own cases, then you’ll need to start off by purchasing a ​great reloading press for beginners. If you want to keep your budget under $2,000, you’re going to be looking at single-stage presses. A single-stage press means that each time you pull the handle, you’ll be reloading a bullet case. With the right practice, you can easily reload hundreds of rounds per hour. 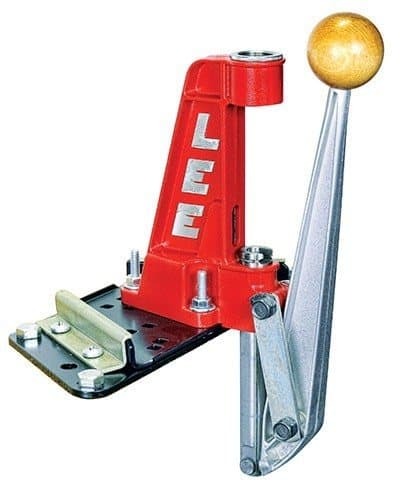 In this review, we're going to be looking at the classic Lee Reloading Press. It's been in production for over fifty years and offers great quality and functionality for both the beginner and experienced user alike. 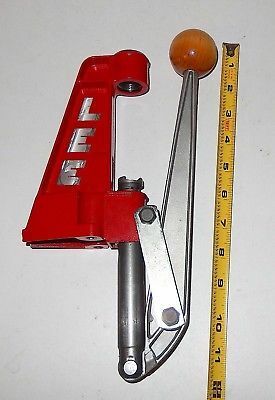 The Lee Reloading press has an overall great quality. It has a classic C-Frame design which allows for easy access. The ram stroke has a length of 3-¼ inches which can handle most small rounds. It wouldn’t be a good idea to press a .50 BMG or a .577 Nitro, but the average beginning reloader won’t likely be working with rounds of this caliber. There have been some reviews stating that they can't handle heavy duty pressing, but for most small rounds this will do the trick. While it doesn't have the ultra-durable tank-like quality of larger reloading presses, it's durable cast aluminum frame holds up very well for the job it does. One of the nice features of this press is that it has a three-point mounting system. This makes a huge difference when you're exerting the downward force required to press ammunition. Other products that only have two-point mounting systems have been known to rip out from the workbench. This could potentially cause serious injuries or even result in half-finished rounds exploding in the press. The handle has a nice wooden ball on its end, which makes it easy on the palm during those long pressing sessions. Many popular presses have a solid metal handle which is fine to press a few casings. But, if you were to try and do a couple hundred rounds, you would quickly find your hand cramping up. The Lee press is simple to use for just about anyone. Once you have your bushings and die installed, and the casing and primer in place, you only have to pull the handle down. Within seconds you have a round that's ready to be loaded back into your firearm. Lee has so much confidence in their product, they even offer a two-year unconditional warranty with their product. That means that whatever the case is, if your Lee reloader breaks or malfunctions within the first couple years of ownership, you are entitled to a free replacement. Perhaps the greatest selling point that this press has to offer is its affordability. Most good quality presses can cost upwards of $200- $300. This retails for way less than ​that. That's right, for ​a mere fraction of the cost, some powder, casings, and tips you can start pressing your own ammunition. The wooden handle is comfortable and easy to hold. The three-point mounting system ensures that the press is securely mounted to the table and can withstand the downward force of pressing bullets. 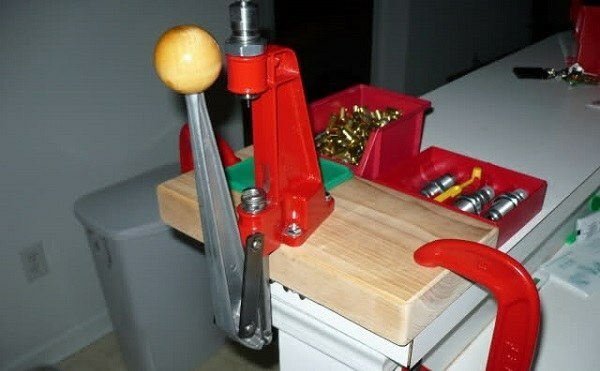 Most people purchase the Lee Reloading Press as a beginner press or as a secondary press to handle light work. The overall consensus seems to be that this is a great press for reloading any small rounds. Keep in mind that buyers shouldn’t purchase this press with the intention of reloading larger cartridges. They use it with small rounds because it's quick and easy. It also takes away the headache of dealing with larger, more powerful presses. Others find the Lee very useful as a secondary press and use it for decapping, depriming, and resizing. Only 6% of the total reviews are bad reviews. Upon further investigation, are usually the result of people trying to press casings that are larger than this reloader is designed to handle. This is an excellent press for those who are just getting into pressing their own cases for the first time, or for the casual reloader who just wants to save some money on small rounds. Reloading is great practice to get into. What better way to introduce yourself to the process than with one of the most affordable products on the market? Lee has a reputation to maintain and hasn't sacrificed any quality in design with this model. In fact, they've been making this particular model for over fifty years. This product is thoughtfully and simplistically designed from the crafted wood handle to the three-point mounting system. This reloader offers a quality you can feel with each press. ​​​​You may even begin to enjoy pressing your own ammunition. It's incredibly easy to install, and bolts right onto your bench. It comes fully assembled and only requires you to install the bushings, die, and the handle. Lee also offers a wide array of add-ons you can purchase with your press. These include a powder scale for measuring your gunpowder, additional die sizes for different calibers, and even a primer feeding tool. I would recommend the primer feeding tool. Primers are small and often very frustrating to handle. The primer feeding tool can hold over a hundred primers and smoothly deposits fresh primers into your press base. With this, you never have to worry about dropping primers on the floor again. With ammunition prices going higher, the practice of reloading has become far more popular. With this popularity, new and flashy products have pushed their way onto the market with high promises. Unfortunately, many just don't deliver. There are many stories of people purchasing cheap presses and having heads constantly jam into the die and handles break off, causing the user a giant headache. The Lee Single Stage Reloading Press offers timeless quality with consistent performance. If you're looking to get into reloading or just need a reliable secondary press, then this is the one for you.